My very final day of only juice! I’m so excited. I even went to the grocery store today and bought things that I don’t plan on juicing! I bought two portabella mushrooms that I’m planning on using for my pizza “crust”, some organic garlic pasta sauce, and some shredded mozzarella cheese. I know I need to do more shopping, but I didn’t bring a list with me so that’s all I could think to get. After 15 days of no fat, oil, sugar, flour, salt, etc. I feel like I am much more conscious about what I’m going to put in my body. That doesn’t mean that I’m not going to enjoy what I eat and eat some bad things along the way. There were displays upon displays of gummy bears, gummy worms, and sour gummies at Safeway today. So tempting, but I was good. I have also realized that I must not have eaten as badly as I thought I did before the fast because I really didn’t experience any detox side effects. Doesn’t mean that there isn’t still room for improvement though! After not weighing in yesterday I did my scale check this morning and was only down .2lbs. Those days where I switch to and from nights really mess me up. I’m not even really eating all that much more than I normally would, but something about being up around 30 hours, even with a nap, just seems to really screw with my entire body. I’m lucky to work 4-10s and have three days off. At least my body semi-adjusts during the week and during the weekend, it’s those in-between parts that are no good. So, the ultimate final weigh in will be tomorrow morning. I’m curious, but I don’t expect to lose all that much more. I can’t believe that this juice fasting experience is nearly over! I can’t put into words how excited I am to eat food again, but I really hoping I don’t get sick. I haven’t read anyone’s versions of what it’s like to start eating real food again, but I’m hoping for a smooth transition. No weigh in for me today. It’s my Saturday, which is part of my Friday, so basically I’ll end up being up around 30ish hours before going to bed and I like to weigh myself first thing when I get up. Hopefully that doesn’t mess with things too much. I had a nice treat today! I went out and picked some blackberries for my lunch juice. So good! I should have picked more but with our lack of sun there weren’t a whole lot of ripe ones just yet, hopefully soon. 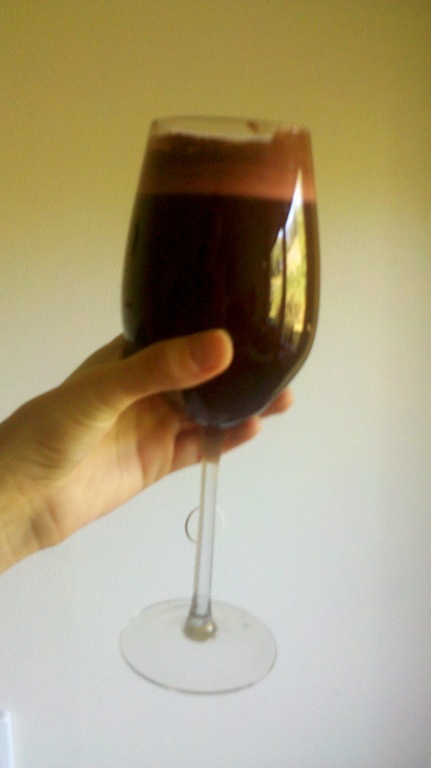 And here’s a picture of, what I’m calling, my Purple Power Juice! 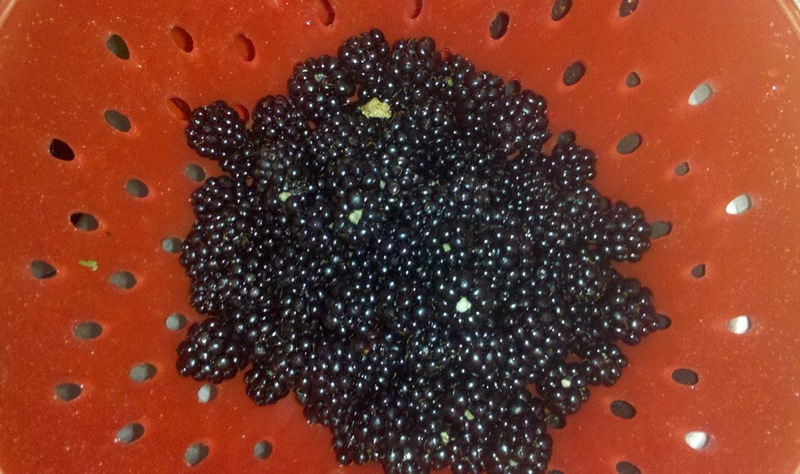 It was so good and now’s the time to take advantage of the blackberry bushes! I couldn’t believe it when I stepped on the scale today for my weight in! I made it to my ultimate goal! I’m at 135.8 today and when I started out I was hoping to see 135 on the scale, but I never actually thought it would happen. I had a loss of .4 and my total loss to date is 10.6lbs. Just a few more days of juice only. I am really looking forward to eating solid foods again. As much as I want to eat pizza and everything bad for me there’s a part of me that realizes that there has never been a time in my life where I’ve been as good to my body as I have been during this fast. I kinda don’t want to ruin that. I have no doubt I will to some extent, but I think I will be able to use moderation better in the future. Made a really good juice today! I think it’s one of my favorites so far. I’m so excited that a lot of people I know are reading my blog and either wanting to get started or have already started doing a juice fast. It’s exciting for me to hear about other people’s successes and to know that I had a part in it, even if it was just for inspiration. Today I’d like to start off with a few things that I’ve had to learn the hard way, so that maybe you won’t have to go through the same things. Last night I made up my juices and headed off to work. Little did I know that both, not one or the other, but both juices were so disgusting that I could hardly drink them. In fact, what I was able to get down was out of sheer will power alone, not because I wanted to. Also, I don’t recommend radicchio or sweet potatoes in juices. I guess sometimes the adventurous part of me gets me into trouble once in a while. So, after work I knew I needed to drink something but I really didn’t want to deal with juicing right before bed so I cheated a little. I went to Safeway and about a Naked Green Monster and drank that before I went to bed. I have to say, I didn’t really like it too much. It has more of a smoothie texture than a juice texture and according to the bottle has pureed fruits rather than juiced. So it was a pretty big cheat, but still staying with in the rules. At least there aren’t any added preservatives or sugars, it’s all natural. For a bottled juice/smoothie I guess that’s doing pretty good. I was pleasantly surprised when I weighed in today! I finally hit to 10lbs lost mark! That was my initial goal. I’ve actually lost 10.2lbs as of today, with a .8lb loss yesterday. I’m down to 136.2 (which totally amazes me) and I’d really love to see 135 on the scale by day 15. If I don’t, I’m not going to beat myself up too badly. I still can’t believe I’ve lost 10.2lbs in 12 days, especially since I didn’t have a ton of weight to lose to start with. Absolutely amazing! So tonight I made sure to taste test my juices for work, they are both delicious! No more cheating with Naked juices for me….at least not for another day. The juice fast experience at work went well yesterday. I have a bad tendency to be at work and think about food when it’s not busy and then before you know it I’m hungry again. Fortunately, I was super busy playing catch up last night so less time to think about being hungry. But, I’ve noticed I rarely feel starving hungry since doing the fast. So, during the day before work I had two juices, and then another two during the night while I was at work, and lots of tea and water. I only lost .2lbs but I’m thankful I didn’t gain and I’m hoping that now that I’ve got my schedule all turned around I will lose a little more tonight. If not, it’s still progress and I’m getting closer and closer to my goal of 135. I’m exactly two pounds away as of today, 137. I stopped at the store this morning after work and picked up some new produce and I’m excited to give it a try. It could be really disastrous, but I’m adventurous enough to give it a try….once! So, in addition to my green staple, spinach, I picked some some radicchio, green cabbage, and sweet potatoes. I’m thinking some sort of sweet potato and orange juice combination would be good. I hope so anyway. On top of the weight loss aspect of feeling good, I’ve been in a really good mood lately. So many fewer negative thoughts going through my head on a daily basis. This could have to do with a number of things, but I’m really hoping it’s from the juicing! I like having a positing outlook on life and the things going on around me. I really do think that if you think good things, good things will happen! Just four days of juice fasting left! I keep thinking about what it is that I’m going to eat first. I know you’re supposed to ease into the food world slowly, but I wish I didn’t have to. 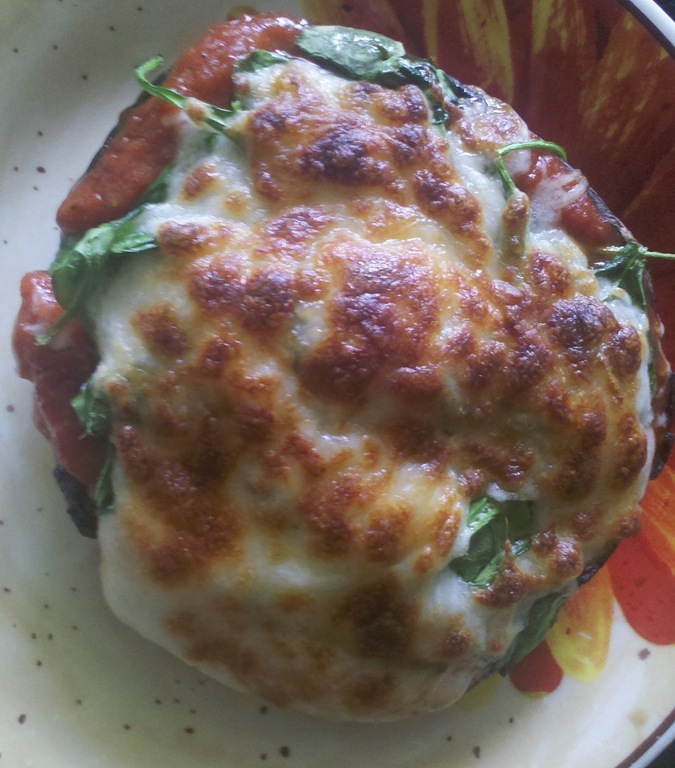 I’ve been thinking about making this portabella mushroom pizza that I saw on someone’s blog. You use the mushroom as the crust, fill it with marinara and top with cheese, and whatever else you might want on there. The cheese might be pushing the boundaries of my stomach, but it sounds so good. That and a banana, which normally I eat all the time. I wish you could juice bananas! Wow! I can’t believe it’s already been 10 days of nothing but juice! Still feeling great and finally really starting to notice a difference when I look in the mirror. Specifically, my stomach looks flatter (obviously since there’s nothing solid in it) and my hips and thighs look much slimmer too. I’m almost tempted to try on some old jeans that I haven’t even thought about being able to wear in a long time (actually since I bought them since they came through the mail and they never fit quite right). Anyway, I’m down a whopping 9.2lbs! Five more days to lose the other .8 to my goal. I can do it! In case you missed my blog yesterday, if you’re thinking about doing this fast you must try the juice-cicles! It’s so nice to chew something and especially during summer to have something nice and cold and refreshing. I’m getting ready to go back to work tonight. My first night back after oral surgery and my first night back while being on the fast. I really don’t know how hungry I’m going to get but I’m bringing three juices with me (hoping this doesn’t throw off my weight loss too much), my herbal tea, and tons of water! I have so much paperwork to catch up on that I’m going to be too busy to think about being hungry for the most part, I hope. I can see the finish line just up ahead. Still craving food, especially bad foods but not as much as before. I hate to admit it but I’d really like some pizza. I think pizza has been my biggest craving this whole time and I don’t even eat it all that much, maybe once a month or once every other month. Weird.